It is finally that time of year! My favorite! Christmas! Oh, of course, I am crazy busy and feeling overwhelmed and thinking I will never get it all done in time, but I always do somehow or other – all the baking, gift buying, wrapping, sewing, knitting, decorating, etc. But the main thing – the reason for the season is not all of the above. No matter whom you worship or how you worship, that is the main event. This year more than ever we need to pray for peace. Our world has gotten a bit out of kilter and there is a lot of hate floating around. Let’s all try to be the change we want to see in our world. Be kind to one another and look out for your fellow man. Give as much as you can. And always let the folks you love and care about, know how you feel. I know you may not share my beliefs or my religion but I still wanted to wish you all a Merry Christmas and a very happy New Year. I just wanted to share my holiday with you. Hopefully, you know that Word allows you to set tabs in a paragraph by clicking on the Ruler at the top of your document window. The tab that is inserted depends on the tab type selected at the left side of the Ruler. You can then click on the tab and drag it to the location desired. There can be times though, when accurately placing your tab stops using your Ruler and the mouse can be very aggravating. You may, as a matter of fact, notice that your tabs seem to move from one location to another as you are dragging them. If indeed, that is what seems to be happening, there are a couple of things you do to fix that. 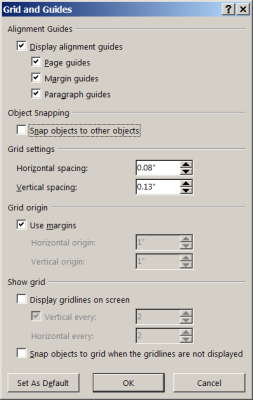 First, you need to know that the grid settings on the drawing layer in Word can affect the dragging behavior for tabs. Word is, by default, configured so that snap to grid is turned on, and the grid is set for 1/16-inch increments. So when you drag a tab stop, it seem to move in increments of 1/16 inch. If you do not need the drawing grid, you can turn it off. Display the Page Layout tab of your Ribbon. In the Arrange group, click the Align drop-down list. Select the Grid Settings option from the drop-down list to display the Grid and Guides dialog box. Deselect the Snap Objects to Other Objects check box. Deselect the Snap Objects to Grid When the Gridlines Are Not Displayed check box. You should now be able to drag tabs along the Ruler smoothly and precisely. If you want to see the precise placement of the tabs, just hold down your Alt key as you drag them. If you are still experiencing problems placing the tabs accurately, you may try increasing your zoom setting for viewing the document, and you should make sure that your mouse is clean as that can also have an effect when moving tabs. It is not out of the ordinary to use Excel to create different types of lists and forms that are used by other people. When you are creating your checklist, you may want to actually put a check mark into a cell. There are a couple of methods you can use to do this. Both involve changing the font applied to your cell and then keying in the character you would like in your cell. Select the cell that you would like to contain the check mark. 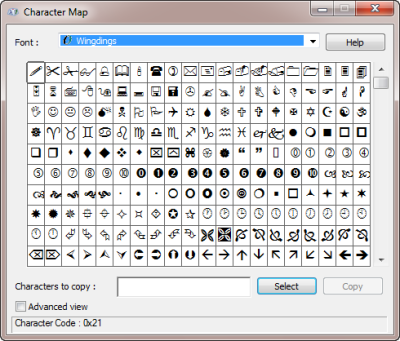 Using the Font drop-down list, select Wingdings. The cell is now formatted to use the Wingdings font. Click on Start | All Programs | Accessories | System Tools to find the Character Map. 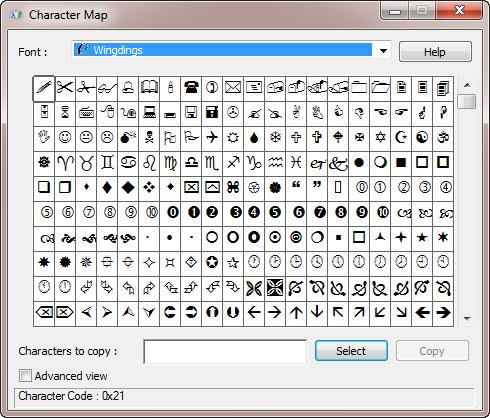 In the Character Map, select the Wingdings font. Scroll though the available characters until you find the check mark you like. Close the Character Map accessory. In Excel, press Ctrl+V to paste the character into the cell. This is quite a few steps to put in a simple check mark. There is a simpler way, however, if you simply remember that you need to pick a font that contains check marks, and then put in the character to produce that check mark. There are without a doubt, myriad other character/font combinations that will result in a check mark in a cell. Simply search until you find the one that suits you! Most people who use Word use the old standby of CTRL +X to move text and CTRL + V to paste it within their Word documents. Did you know there is an alternate method to do that? No? Well surprise, surprise! There is! Highlight any block of text that yo would like to move. Place your cursor at the place where you would like to move your text to. Your text has now been moved! Go ahead and try it – it’s pretty cool and I am sure there will be many times when you can use this handy little trick. If you know the unicode for a character, you can quickly add it to your document by keying in the code followed by ALT + X. For example, the unicode for the Euro symbol is 20AC. So go ahead and key in 20AC using your Numpad and then click ALT +X and voila! The actual Euro symbol appears in your document. See the great things you learn in Carol’s Corner Office? The little things come in handy! Many times we need an envelope that includes a text box under the return address. The text box could contain the words RETURN RECEIPT REQUESTED or PERSONAL & CONFIDENTIAL (among other things) all in caps, bold, and underlined. So how do we do this quickly and without reinventing the wheel every time we need this? There are a couple of different methods to achieve this. First, you could simply create a Word template for your envelope. Just create a normal envelope, making certain that everything is exactly the way you want it. (Do not forget your text box under the return address.) Instead of printing your envelope, use Save As to save it as a template. In the future you can create a new document based on that template, and you will end up with an envelope you can modify to suit your current needs. Create the text box as you want it to appear on your envelopes. Click Alt+F3. The Create New Building Block dialog box will display. 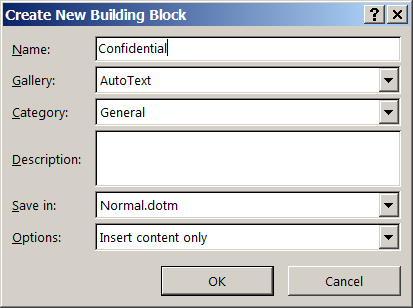 Change the name in the dialog box to something like rreturn or cconfidential. Note that there are duplicate letters at the beginning of each of these names. That is so that the words used to trigger the AutoText feature are unique. Use the Gallery drop-down list to choose AutoText. You have now created your AutoText entry. Amazing how simple it is, isn’t it? If your office generates a lot of letters, this is the tip for you! This will show you how to store common addresses that you use often in AutoText entries. You will then only need to input the first name or surname of the contact you need, press F3, and the address will be inserted at the top of your letterhead. You all know I love to save time and keystrokes and hopefully, you do as well! Click Alt+F3. 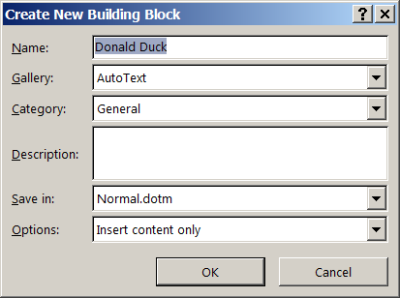 Word displays the Create New Building Block dialog box. Replace the contents of the Name field with the name you want assigned to the address. For instance, use the last name of the person or the person’s title. As I am sure you know, there are instances where we need to align the decimal points in a column of one of our worksheets. Luckily, this is fairly easy to accomplish using the Format Cells function. Select the column of numbers which you would like decimal aligned. 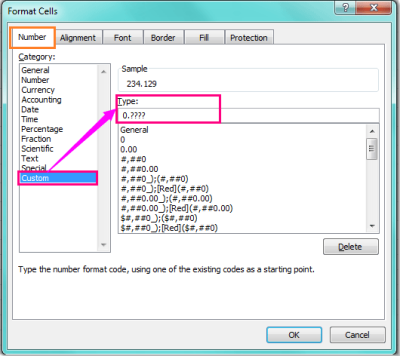 Right-click and select Format Cells from the context menu that will display. In the Format Cells dialog box, under the Number tab, select Custom. Key in 0.???? into the Type box. That is a zero (the number), not the letter. Take note that the question mark (?) is for the number of your decimal digits. If the highest decimal place is 5, you will enter five question marks. The numbers you selected in the column will now align on the decimal point for left, center and right alignment. Be advised that if your data contains whole numbers, they will have a dot added afterward. If, like me, you use fields in your documents, you might have an occasion where you need to delete a specific kind of field, without removing all the other types of fields in your document. You can use the ^d special character in the Find What box when doing a Find and Replace, but using the ^d switch does not discriminate in that it finds all fields. There are a couple of ways in which you can approach this problem. First, when using ^d, you can follow it by the field code you want to search. Then, if you search for ^d XE you can find all the XE fields in the document, ignoring the rest. The second way is to search using the ^19 character. This is the code for an opening field brace. Follow it by the field you want to select, as in ^19 DATE, and only those fields are found. Regardless of whether you use ^d or ^19, you need to note to what immediately follows. Word is very liberal about the number of spaces that can follow an opening field brace. There could be no spaces after an opening brace or two, three or more spaces. It is for this reason, that you will want to search for both ^dXE (no spaces) and ^d^wXE (multiple spaces, with the ^w representing white space). The same goes for the second method: you can search for ^19DATE and ^19^wDATE. While you are searching for specific fields in your document, you will need to be sure that your field codes are displayed in your document. If you do not display them, Word will ignore the codes. You can display them all by pressing Alt+F9. Also, you need to be sure that Hidden Text is displayed.